Congratulation to the winners of the Daily Positive (D+) World's Most Positive Countries 2018! In the eighth year of the award series, Canada is named the World's Most Positive Country for 2018. For more on the winners visit World's Most Positive Countries 2018 Press Release. The annual event to reveal the World’s Most Positive Countries recognizes the countries with the most positive initiatives and actions. D+ introduces this list of countries based on a positivity index. * Canada made it to the top for the first time ever in the 8th year of this award series. * The USA could not make it to the main list of positive countries for the first time. * Japan made it back to the list of positive countries since 2014. Singapore and New Zealand made it back since 2016. * Ethiopia, North and South Korea, Iceland, the USA and Chile are the regional winners. * Winning it for the World as a Team, was the main theme observed among all the positive news from 2018. * For the first time in last five years, global citizens had positive projection for the world. Canada was named as the World’s Most Positive Country in 2018 for the first time ever, according to the annual global index published by Daily Positive (D+), a unique online media organization from Australia for positive news. The annual list of top ten most positive countries is compiled based on a positivity index comprised of a global expert panel rating, a D+ journalists rating, a global web poll and the number of positive news entries in 2018 on the D+ website. Apart from this overall list of 10 most positive countries, D+ also published a list of regional positive countries from Africa, Asia, Europe, North America and South America. The regional winners were selected based on the same criteria used to select the overall winners but from a specific region outside of the top ten in the list. Canada was crowned as the World’s Most Positive Country in 2018 for the first time ever in the 8th year of this award series. Canada has been persistent throughout this journey with advanced scientific research, economic development and for standing up for the values that they believe in. Canadian researchers have developed a handheld 3D skin printer that deposits even layers of skin tissue to cover and heal deep wounds. Canadian scientists have developed T-CUP, the world’s fastest camera, capable of capturing ten trillion frames per second. The Nobel Prize in Physics 2018 was jointly awarded to Donna Strickland of Canada. Dr. Strickland is the third woman to receive the Nobel Prize in Physics since its creation in 1895, and the first female laureate in 55 years in this discipline. Despite being put under unprecedented pressure by other countries, such as the USA and Saudi Arabia, Canada showed strong courage and came out as the winner at the end. They were able to secure new North American Free Trade Agreement (NAFTA) deal and were able to keep the unemployment rate down, at one point the unemployment rate dropped to 4-decade low at 5.8%. Finally, Canada has created the largest area of protected boreal forest in the world in Alberta, an area twice the size of Belgium. Australia lost its crown from last year to Canada and is in the second position. In 2018, political instability slowed the amazing run that the Australian had for some time. Despite the slow run, Australia was steady. Australian researchers have developed the world’s first blood test capable of detecting melanoma in its early stages, a breakthrough that will save thousands of lives, as well as millions of dollars for the health system. Professor Akshay Venkatesh became the second Australian to be awarded the most prestigious prize in the mathematics world, the Fields Medal. Australia's first electric plane, the Pipistrel Alpha Electro two-seater, successfully completed its maiden flight. Also, Australia gained global admiration by hosting an impressive Commonwealth Games in the beautiful Gold Coast. Japan had the most impressive climb of all time in the list of most positive countries. The last time Japan was in the list of most positive countries was in 2014. In four years, they turned it around and jumped into the third position in 2018. According to UNICEF, Japan ranked as the world’s safest country for the newborn with lowest newborn mortality rates. Japanese film director Hirokazu Kore-eda’s Shoplifters won Palme d’Or at the Cannes Film Festival. Japan signed a Free Trade Agreement (FTA) with the European Union (EU) that covers 600 million people and almost a third of the global economy. Naomi Osaka of Japan defeated Serena Williams to win the 2018 US Open women’s singles tennis title, becoming the first Japanese player to win a major singles title in the history of the sport. Most recently, Japanese passport was ranked as the most powerful in the world. England climbed up four spots in the list of most positive countries from last year and is in the fourth position. Researchers from the University of Oxford in England have completed the first successful trial of robot-assisted eye surgery. English scientists have discovered three new species of fish, temporarily named the pink, the blue and the purple Atacama Snailfish, in the extreme depths of the Pacific Ocean. English scientists have succeeded for the first time in wiping out an entire population of malaria-carrying mosquitos in the lab. English teacher Andria Zafirakou, from the Alperton Community College of Brent in one of the UK's poorest areas, won the $1 million Global Teacher Prize. China is in the fifth position in the list of most positive countries for 2018. On our global poll, China was seen as the most focused country with clear aims. China continued to march forward with their BeiDou navigation and positioning system and successfully launched the planned satellites for 2018 required for the system. In a world first, Chinese researchers have successfully cloned macaques using the same technique that yielded the famous clone Dolly the sheep. Chinese researchers have created new ultrafine films—based on nanoparticles that are more than 80 times thinner than a human hair—that could lead to materials that can holographically archive more than 1000 times the data as a DVD. China officially opened the world's longest sea crossing bridge, spanning around 55km and connecting Hong Kong to Macau and the mainland Chinese city of Zhuhai, yet another sign of rapid development that China is focusing on both inside and outside of the country. France moved down one spot to the sixth position in the list of most positive countries compared to last year. Among all the positive achievements of France, the 2018 FIFA world cup win was the most memorable and admirable for the French people. It was France’s second world cup title. Apart from that, in a world first, doctors at the Georges-Pompidou European Hospital in France have performed second face transplant on the same patient. France has been in the forefront of the global environmental campaign. As a result, French President Emmanuel Macron was awarded the 2018 United Nations (UN) Champions of the Earth Award in the Policy Leadership category for his pioneering work on the Global Pact for the Environment. Singapore came back strong with some upbeat accomplishments to take the seventh spot in the list of most positive countries for 2018 after missing out last year. Scientist in Singapore have become the first in the world to 3D print human skin that match our natural colors and pigmentation. Singapore airlines and the Changi Airport continued to be the very best in the world. Singapore was ranked as the safest country in the world for third consecutive year according to the annual Gallup Global Law and Order report. Singapore topped the World Bank Group's Human Capital Index that quantifies the contribution of health and education to the productivity of the next generation of workers. Germany made it to the eighth position in the list, two spots down from last year. Some of the notable German initiatives from 2018 are, Germany was elected as a non-permanent member to the United Nations (UN) Security Council to serve during 2019-2020. Germany rolled out the world's first hydrogen-powered train, the Coradia iLint, in northern Germany powered entirely by eco-friendly hydrogen fuel cells. Despite notable opposition against the Refugees in Germany, our global poll participants hailed Germany as the Humanitarian Champion for its leadership in supporting the Refugees. Apart from that Germany remained innovative with global scientific collaborations, such as, a German-English team have found a way to harness sunlight to make fuel by splitting water into hydrogen and oxygen. Denmark clinched a spot in the list of most positive countries for the second consecutive year and is in the ninth position. Denmark topped the ranking at the 2018 United Nations (UN) E-Government Survey, which measures countries’ use of information and communications technologies to deliver public services. Denmark has been supportive to the environmental issues. For instance, wind power generated over 40 percent of electricity consumed in Denmark, a record for the Nordic nation which aims to rely on renewables for half of its energy needs by 2030. Speaking of the year 2030, Denmark has announced plans to phase out diesel and petrol cars, banning the sale of these vehicles from 2030 onwards. New Zealand took the last spot in the list of 10 most positive countries for 2018. According to one of our external-panel members, “New Zealand seems to keep it to themselves and keeps a low profile, while still making strong statements in various social issues”. New Zealand did justice to that comment as they ranked as the least corrupt country in the world. New Zealand's parliament passed a law granting paid leave for victims of domestic violence. Apart from that New Zealand scientists have performed the first-ever 3-D, color X-ray on a human, using a technique that promises to improve the field of medical diagnostics. Ethiopia, for the first time ever, made it to the list of most positive regional countries. Ethiopia stood out with their dedication to establish peace and good relationship with their neighbors. Ethiopia signed an agreement with Eritrea to officially end the war between the countries that first broke out in 1998. A 756-km electrified railway connecting landlocked Ethiopia to Djibouti officially started commercial operations. Ethiopian airline made the first commercial flight between Addis Ababa and Mogadishu in Somalia in 41 years, in yet another sign of warming ties between the neighboring nations. Apart from that Ethiopia was in the news for some popular internal policies, such as, Ethiopia's parliament elected Sahle-Work Zewde as the country's first female president and Ethiopian Prime Minister Abiy Ahmed appointed a cabinet with half the posts taken up by women. North and South Korea were jointly named as the most positive countries from Asia in recognition of the ongoing peace process between the two neighboring countries. North and South Korea committed themselves to the complete denuclearization of the Korean Peninsula and pledged to bring a formal end to the Korean War. This by far was the most popular and talked-about positive news in 2018 according to the global news coverage and social media attention. Additionally, both the countries shined in sport events, such as, Winter Olympics and Asian Games in 2018. Iceland took the regional title of Europe. Iceland became the first country in the world to legalize equal pay between men and women in bid to close gender gap. Under the new rule, companies and government agencies with more than 25 employees will face fines if they cannot demonstrate that men and women receive the same salary for the same job. Iceland was ranked as the most peaceful country in the world according to the 2018 Global Peace Index. Icelandic economy was ranked as the second best among the advanced economies by the World Economic Forum. The United States of America (USA), for the first time ever, could not make it to the main list of positive countries. This year the USA did not have enough support on our global poll and from our expert panel members. However, the USA was crowned as the regional winner from North America. As expected, the USA retained its leading position in scientific innovation. For example, American biologists have successfully transferred a memory from one marine snail to another, creating an artificial memory. This research could lead to new ways to restore lost memories. The USA also dominated the list of Nobel Prize winners as their researchers won the prize in Medicine, Physics, Chemistry and Economic Science in 2018. Chile is back as the regional winner from South America since 2015. Chile made history when it became the first country in Latin America to ban the commercial use of plastic bags. Chile created a new law protecting the waters along its 6,400km (4,000 mile) coastline which creates nine marine reserves. Other notable positive achievements are, Chilean film A Fantastic Woman won the Best Foreign Language Film award at the 90th Academy Awards and Chile was recognized as the Leading Adventure Tourism Destination in Latin America at the 2018 World Travel Awards. This year 4117 global citizens participated in our global poll with 47% men and 53% women. This is the third consecutive year we had more women participants than men. The global poll was successful in attracting approximately uniform amount of votes from all the regions of the world. The age distribution of the participants suggests, people aged between 30 to 50 were the most vocal in our poll. Based on our text analysis of all the positive news published on D+ in 2018, it is observed the World aspired to work as a Team and Won. That was the main theme observed among all the positive news, as Won, World and Team were the three most used words among all the positive stories from 2018. We also looked at the associated words to these three most used words. The association analysis revealed that when the world worked as a team women turned out to be the winner, economy grew and science had international impact. The most popular topics of positive accomplishments among both men and women on our global poll, in sequence, were Humanitarian Initiatives, Environment, World Peace, Science & Innovation, Economy, International Relations and Anti-Corruption Initiatives. Women had higher number of votes on each of the mentioned topics, except International Relation. Two new entries to this list of topics in 2018 were Humanitarian Initiatives and Anti-Corruption Initiatives. Further analysis of the comments made on the global poll suggests, the participants reacted positively to the overall Humanitarian Initiatives around the recent refugee crises, wars and natural disasters. Also, a strong voice against corruption was shouted which was often blamed for the most of the political crises in a country. For the first time in five years it was observed that the percentage of people hopeful for positive future of the world, primarily the immediate future, climbed in the upward direction. This positive projection was not necessarily because all of our global poll participants believed something magical is taking place around the world but because people believed it is about time for the worse to be over. There were so many other positive stories that took place beyond the above winners’ list. India made unprecedented pledge to eliminate all single-use plastic in India by 2022. Various new laws empowering women in Morocco, including a new law criminalizing violence against women, came into effect. Malaysia's cabinet has agreed to abolish the death penalty and halt pending executions. “In 2018 there were so many positive stories all around us, from Bangladesh's continuous support for world's most prosecuted minority – the Rohingya People of Burma, to denuclearization of Korean peninsula, to Africa standing up for itself with Continental Free Trade Area agreement and many others. These positive stories are not only inspiring but also major steps towards the right direction.” says Dr. Arif Jubaer, Founder of D+. External expert panel rating. Each panel member will select ten countries. The top most country in each list will score 10 points and the last country in each list will score 1 point. Apart from that these panel lists will also work as benchmark to ensure that our social media fan rating is not biased. Internal D+ volunteer-journalist panel rating. Like the external panel this panel members will also select ten countries individually. The top most country in each list will score 10 points and the last country in each list will score 1 point. D+ social media fan rating. Each vote will carry 1 point. Anyone can vote with a valid email address. In case of multiple votes from same email only the first vote will be retained. More updates can be found on D+ Facebook Fan Page or Click Here to participate. The Country pages on D+ with most number of positive news from 2018 will score higher points. Each published news that took place in 2018 will carry 10 points. Each country will score a total from each of the above categories which will then be added together to compute the final results. The country with the highest total points is considered the most positive country. Ten countries in all will be ranked - the most to the tenth most positive countries. For more information and further details on each of the above mentioned factors feel free to email us at info@dailypositive.org. Higher rating for most visited country pages on D+. Higher rating for most visitors (from each country) on D+ in search of positivity. What is “World’s Most Positive Countries (WMPC)”? D+’s annual initiative World’s Most Positive Countries (WMPC) selects countries based on positive events, such as, business developments, peace projects, sports achievements and scientific innovations accomplished during the current calendar year inside the countries and in the global stage. For the WMPC initiative D+ considers only those achievements that are accomplished in a competitive manner and have significant impacts on the lifestyle of the citizens under the given context of each individual country. Example of positive news are, but need not be restricted to, revealing Nobel Prize Winners, Sports World Cup Winners, New Inventions, New World Records etc. D+ does not consider “feel-good” news, such as, donation of a local citizen to a local charity, saving a dog from a burning house etc. Instead it captures accomplishments with widespread impact on the community within a country and beyond. Each of D+’s news content is curated and researched by international researchers, independent journalists and community contributors at the time of publishing the news. What is that WMPC captures? The initiative of the World’s Most Positive Countries endeavors to calculate and quantify the impact of the positive accomplishments from different disciplines and subject-matters for each country. D+ ranks all countries in the world based on its positivity index. * Australia returned to the top spot for the first time since 2011. * There are four changes in the overall list of positive countries in 2017 compared to last year. * Denmark and the Netherlands made it to the list for the first time ever. * France and England are back to the list of positive countries since 2014 and 2015 respectively. * Nigeria, Bangladesh, Norway, Cuba and Colombia are the regional winners. * Analysis of all the positive news from 2017 suggests that the newsmakers worked with passion to create a positive impact in the world. * Global citizens continued to be less hopeful for the immediate positive future of the world. Australia crowned the World’s Most Positive Country for 2017, for the second time ever in half a decade, according to the annual global index published by Daily Positive (D+), a unique online media organization from Australia for positive news. The annual list of top ten most positive countries is compiled based on a positivity index comprised of a global expert panel rating, a D+ journalists rating, a global web poll and the number of positive news entries in 2017 on the D+ website. Apart from this overall list of 10 most positive countries, for the third time, D+ also published a list of regional positive countries from Africa, Asia, Europe, North America and South America. The regional winners were selected based on the same criteria used to select the overall winners but from a specific region outside of the top ten in the list. Australia topped the list of most positive countries in 2017 and it took them half-a-decade to reclaim the top spot. Gradual development and patient build up over the past few years helped Australia return to the top. Australian medical research continued to explore new ideas with worldwide impact. Other research areas have also been impressive, for example, Australian archaeologists have confirmed that Aboriginal people have been in Australia for at least 65,000 years – much longer than the 47,000 years thought previously. First Australian-built satellite CubeSat was launched in 15 years. Women’s sports was flying high, including Australian women’s football team winning the inaugural Tournament of Nations defeating Brazil. Our global survey suggests Australia was seen as a positive role model especially against the changing political situation in North America. 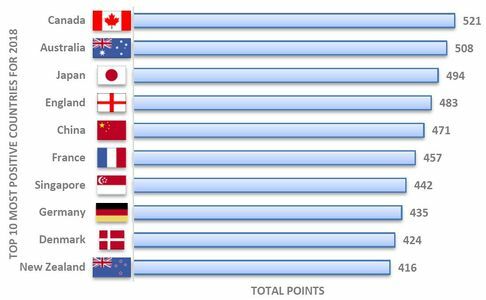 Canada jumped into the second spot in 2017 from last year’s fifth position. Canadian universities were impressive with their researches. Canadian researchers at the University of Waterloo have captured the first composite image of a dark matter bridge that connects galaxies together. Canadian scientists from the Royal Ontario Museum have identified and named a new species of armoured dinosaur, Zuul crurivastator. Like Australia, Canada has also emerged as new positive voice against global political instability. In line with that positive vibe, Canadian school teacher Maggie MacDonnell won the annual Global Teacher Prize for encouraging hope and acts of kindness in a remote Arctic village called Salluit in Quebec. After two years at the top of the list of most positive countries, Switzerland moved down to third in the ranking in 2017. “While maintaining stability, prosperity and livability internally, and hosting a range of international organizations, Switzerland continued to be exemplary”, says one of our expert panel members. Swiss tennis master Roger Federer’s incredible reemergence with Australian Open and Wimbledon Grand Slams was one of the most inspirational sporting stories of 2017. The Charles Kuonen Suspension Bridge, the world's longest suspension footbridge - measuring over 1600 feet in length and rising as high as 279 feet, was opened in the country as part of continuous development. Swiss scientists have succeeded in deciphering the entire visual network in the brain of a fly that is expected to support brain research. Finally, Switzerland retained its rank as the world’s most competitive economy for the ninth consecutive year. Like Switzerland, China also shifted down two positions in the list of positive countries in 2017. Despite the shift, China through the Belt and Road initiative, has been stimulating a range of infrastructure development projects throughout the world and strongly emerged as leader in world affairs. China not only changed the stigma of world’s worst polluter but also established itself as the renewable energy champion. China topped the world in renewable energy production, connected the world’s largest floating solar PV power plant to the grid and topped the Renewable Energy Country Attractiveness Index in 2017. Among other positive initiatives, Chinese researchers teleported the first ever object, a photon, from the earth to a satellite orbiting more than 500 kilometers above. France made it back to the list of most positive countries after two years and secured the fifth spot in 2017. France was highly praised in our global poll for its resilient and courageous stand amid all the recent terrorist attacks on French soil and to let that attitude to shine by electing a fresh government. Apart from that, France banned the breeding of killer whales and dolphins in captivity, French model Iris Mittenaere was crowned as the 65th Miss Universe and because of the revolutionary research work by French scientists a man in a permanent vegetative state (PVS) for the past 15 years has shown signs of consciousness after pioneering nerve stimulation treatment. Germany moved up two positions in the list in 2017 compared to last year. German economy remained solid and as a result, the unemployment rate has been downhill in 2017. German scientists continued to innovate and impress. The world's biggest solar simulator Synlight was switched on in Germany, dubbed as "the world's largest artificial sun", intended to develop production processes for solar fuels, including hydrogen. German scientists have recently, for the first time, extracted full nuclear genome data from ancient Egyptian mummies. Denmark made it to the list of most positive countries for the first time ever and reached at the seventh position. In 2017, Denmark ranked as the least corrupt nation in the world. Danish press has enjoyed one of the greatest freedoms in the world. Researchers from Denmark for the very first time revealed that antibiotic resistance genes originate from the same place as the antibiotic compounds, i.e. from a group of soil bacteria called Actinobacteria. Lastly, Viktor Axelsen claimed Denmark's first men's singles gold in 20 years at the Badminton World Championships. After missing out last year, England made it back to the list of positive countries in 2017. England is at the eighth position in the list experienced greater success in global university rankings. That translated into many distinguished awards and researches e.g. English researchers won the prestigious Brain Prize 2017 for explaining how learning is associated with the reward system of the brain. English scientists have discovered a new shrimp species Synalpheus pinkfloydi off the coast of Panama. In sports, English cyclist Chris Froome won his fourth Tour de France title representing Team Sky. The Netherlands is another newcomer to the list of positive countries for 2017 and is at the ninth position. In our global poll the Netherlands was hailed for good governance, innovation and quality of life. All Dutch trains are now 100 percent powered by electricity generated by wind energy, according to the national railway company NS, calling it a world first. More on the same note of environmental innovation, they officially opened the Gemini Windpark, a 600 megawatt (MW) offshore wind farm off the coast of the Netherlands. Dutch team claimed their seventh title in the Challenger class at the 2017 World Solar Challenge, a biennial solar-powered car race. Finally, the Netherlands women claimed maiden European soccer title by beating Denmark 4-2 in the UEFA Women's Euro 2017 championship. The United States of America (USA) slipped down to the last position in the list of top 10 most positive countries in 2017. Almost predictably the USA continued to dazzle the world with its innovations. American space transport services company SpaceX launched its first recycled cargo ship to the International Space Station, yet another milestone in its bid to drive down flight costs. American scientists have developed an artificial womb that can sustain premature lambs, and such technology could soon be useful to save prematurely born human babies. American scholars won the Nobel prizes in Medicine, Physics, Chemistry and Economics. Nigeria is back as the regional winner of Africa after missing out last year. Nigerians have excelled with glittering awards, such as, the Royal Academy of Engineering Africa Prize for Engineering Innovation, World Food Prize and BBC World News Komla Dumor Award. The Nigerian robotics team won a gold medal at the FIRST Global robotics competition in Washington DC. Nigeria did not ever give up on the kidnapped Chibok schoolgirls and continued to make progress and rescued significant number of the girls in 2017. There were simply no other choice but Bangladesh for this year’s Asian regional winner. It is mainly because, along with many positive achievements, in 2017 Bangladesh dealt with the world’s fastest growing refugee crisis with open arms and saved the world from a huge catastrophe. Huge credit goes to the current Bangladeshi government and Bangladeshis from across the country who raced to save Rohingya refugees fleeing the brutal ethnic cleansing operation of Burmese military. Bangladesh became exemplary for the regional powers and many developed nations with its humane response to deal with well over half-a-million refugees that arrived in the country in few weeks. Apart from that, Bangladesh inaugurated its first solar-powered Food Warehouse with a capacity of 25,000 tonnes of grain. Bangladesh launched its first ever nano-satellite Brac Onnesha. Bangladeshi surgeons successfully separated two 9-month-old sisters born pygopagus in a complex operation. Norway is the regional winner from Europe. Norway topped the World Democracy Index indicating that it has a near-perfect fully functional democracy. That helped Norway to achieve best press freedom in the world. As part of continuous economic development, Norwegian solar panel maker Saga Energy recently signed a deal worth 2.5 billion euros ($2.9 billion) with Iran's state-owned company Amin Energy Developers to build solar power plants in Iran. Cuba retained its regional title for the third consecutive year. After job well done by the Cuban medical professionals in West Africa to fight Ebola since 2014, the World Health Organization (WHO) recognized their efforts in 2017. Cuba continued its positive attempt to integrate and engage further with the international communities. As a result, first ever cooperation agreement between the European Union and Cuba was approved in order to expand bilateral trade, promote dialogue and provide joint action on the world scene. Colombia became the regional winner from South America for the second consecutive year. Colombia continued to build on the peace process that started for last few years in order to neutralize the local armed groups. Also, Colombian singer Shakira received the 2017 Crystal Award for her efforts to help displaced and disadvantaged children in Colombia. Colombian President Juan Manuel Santos was named as one of the most influential people by Time Magazine for his determination to establish peace. Natalia Ponce de Leon of Colombia, a human right activist and acid attack victim, was honored with the United States Secretary of State’s International Women of Courage Award 2017. This year 3928 global citizens participated in our global poll with 49% men and 51% women. This is the second consecutive year we had more women participants than men. The global poll was successful in attracting approximately uniform amount of votes from all the regions of the world. The age distribution of the participants suggests, people aged between 30 to 60 were the most vocal in our poll. Based on our text analysis of all the positive news published on D+ in 2017, it is observed that “World” is the most prominent word appeared repeatedly in the news. Further analysis suggests it is because all the newsmakers worked in their respective fields to have a positive impact in the world. Furthermore, scientists and researchers have been spreading their amazing discoveries through international journals. Women empowerment and development have been at the forefront of key initiatives around the world. Winning major awards and securing top positions in world rankings have been the trend in 2017. The most popular topics of positive accomplishments among both men and women on our global poll, in sequence, were World Peace, Economy, Environment, Science and Innovation, Education, International Relations and Sports, among others. While women were more concern about Environment, Science and Education, men were interested in topics, such as, Economy and Sports. However, activities around World Peace obtained the most combined attention from both men and women. D+ continued to observe the trend of the percentage of people hopeful for positive future, primarily the immediate future, based on the comments made during its global polls since 2011. It is observed that since 2013 people’s positive outlook continued to decline. Volatile geopolitical situations, terrorism, natural disasters and violence resulting in mass refugees were identified as the main causes for such decline in outlook in 2017. Other nations outside of the list of most positive countries also made 2017 a memorable one. Iceland topped the list of the world’s most peaceful country. Tunisia, Jordan and Lebanon abolished a law that allowed rapists to avoid prosecution by marrying their victims. Saudi Arabia's King Salman issued a decree allowing women to drive for the first time in the Kingdom. India created history by successfully launching 104 satellites on a single mission, overtaking the previous record of 37 satellites launched by Russia in 2014. Portugal won the Eurovision Song Contest for the first time since it first entered the contest in 1964. “On the occasion of D+ world’s most positive countries 2017, it was great to see people from all around the world coming together and working for a positive world despite all the negativities surround them. For the positive newsmakers, 2017 was not about their individual dreams, rather it was about the dreams for a positive world.” says Dr. Arif Jubaer, Founder of D+. D+ will present the above information and facts in detail at a presentation ceremony on Saturday, 25 November 2017, 2.00PM in Melbourne, Australia. * Switzerland is named World’s Most Positive Country for two consecutive years. * Italy made it to the overall list of positive countries for the first time ever, and Canada made it back to the list after two years of absence. * Africa, Asia, Europe and South America, except North America, all have new regional winners this year. * In 2016, Africans liked the North Americans, Asians liked the South Americans, South Americans liked the Africans and both North Americans and Europeans endorsed themselves. * Global citizens became less hopeful regarding an immediate positive future for the world. Switzerland clinched the title of the World’s Most Positive Country for 2016 for the second time in a row, according to the annual global index published by Daily Positive (D+), a unique online media organization from Australia for positive news. The annual list of top ten most positive countries is compiled based on a positivity index comprised of a global expert panel rating, a D+ journalists rating, a global web poll and the number of positive news entries in 2016 on the D+ website. Apart from this overall list of 10 most positive countries, for the second time, D+ also produced a list of regional positive countries from Africa, Asia, Europe, North America and South America. The regional winners were selected based on the same criteria used to select the overall winners but from a specific region. Switzerland continued to amaze the world with sustainable developments and innovative initiatives. Some of the notable initiatives from 2016 are the inauguration of the world's longest and deepest rail tunnel under the Swiss Alps, breaking the world record for acceleration by a new Swiss electric car, and the historic completion of round-the-world journey by Solar Impulse 2, becoming the first airplane to circle the globe powered only by the sun. Among many Swiss sporting heroes from 2016 perhaps Stan Wawrinka, with his US Open Grand Slam tennis win, topped the list. Switzerland remained committed to help alleviate global poverty with a huge financial commitment to international organizations like the IMF. Switzerland continued to showcase the country's ability to deliver secure, affordable and sustainable energy. China secured the second spot in the list of most positive countries, and it is the best ever ranking position for China in the history of the list. In 2016 the Chinese space program reached to a new height. Among many success stories, China successfully launched the world’s first quantum satellite, and launched its second space lab Tiangong-2 into orbit, paving the way for a permanent space station the country plans to build around 2022. China launched its longest manned space mission, sending two astronauts into orbit to spend a month aboard the space laboratory Tiangong-2 that is part of China's future permanent space station. Chinese sports heroes shone at the Rio Olympic and beyond. In a sign of great environmental commitment, China's wind power capacity overtook the European Union (EU) total for the first time, according to the official statistics published by Global Wind Energy Council. Sweden swapped position with China in the list of most positive countries in 2016 compared with last year. In 2016, Sweden was named Europe’s most innovative country by European Commission, and ranked second at the Global Innovation Index because of their capacities and results for innovation. With such titles in possession, Swedish researchers continued to shine on the international stage. Sweden continued to be one of the least corrupt countries in the world, and clinched the top spot on the Girls’ Opportunity Index, a global index that provides a snapshot of the situation of girls in respective countries according to their opportunity to control their own lives and to fulfill their potential. Australia moved up one spot in the list into the fourth position in 2016 compared with last year. Australian medical research had a great year and that helped boost Australia’s position in the ranking. Australian researchers built a world-first robotic surgical system, named HeroSurg, that gives surgeons the sense of touch while they drive a robot to conduct keyhole surgery via a computer. Australian surgeons performed Australian-first surgery on a baby diagnosed with spina bifida while it was still in the womb. Apart from these accomplishments, Australian researchers collaborated in a wide range of research fields with the international community. Despite apparent slow going, some of the biggest Australian businesses came back strong this year. For example, Australian flag carrier Qantas airline not only made profit after years of loss, but also was voted world's safest airline for the third year running. Canada has been experiencing a new vibe in internal-external policy development with a fresh federal administration in charge. Perhaps that positive vibe put Canada back into the list of most positive countries after two years of absence. This Ice Hockey mad nation kept the top world titles to themselves. The Canadian economy is showing signs of growth despite early-year glitches. That in turn kept the recent national unemployment rate steady or lower compared with the first half of the year. Canadian researchers continued to innovate with projects such as ReFlex – a unique bendable smartphone. New Zealand ranked as the sixth most positive county in the world. It is the best ever ranking position for New Zealand in the sixth year of running this award series. In 2016, Rugby, Cricket and Golf produced some notable positive stories for New Zealand in the sporting world. Foreigners who voted for New Zealand in our global poll were impressed by its hospitality, strong identity and openness. New Zealand was ranked as one of the least corrupt countries in the world. Singapore moved up two spots in the ranking compared with last year. Singapore's education system from school to university remained top class. The 2016 Olympics brought the best ever Olympic moment for the country when swimmer Joseph Isaac Schooling won the country's first-ever Olympic gold medal with his 100m butterfly swimming victory. Singapore stayed innovative with initiatives like introduction of the world's first self-driving taxi service trial. Germany slipped down two spots in the list of most positive countries in 2016 compared with last year. However, Germany is still seen as being highly responsible in keeping the European Union together. As part of its Green Economy and Green Energy advancements, Germany announced a plan to ban fuel vehicles by 2030. "In 2016, Germany had a robust economy that invested heavily in renewable energy (wind and solar), continued to introduce innovation in the auto industries and in general remained one of the strongest competitive economies of the world", says one of our expert panel members. German tennis star Angelique Kerber established herself as a new tennis power house by winning the 2016 Australian Open and US Open grand slams. Despite keeping the title of the Land of Unbridled Opportunity, the United States of America is in the ninth position in 2016. The US demonstrated positive leadership by being a relatively early signatory of the Paris agreement in order to deal with greenhouse gases emissions mitigation, adaptation and finance starting in the year 2020. Continuing with the theme of the environment, the United States of America created the largest marine reserve on the planet, by expanding the Papahanaumokuakea Marine National Monument off the coast of Hawaii to 582,578 square miles. The 2016 Rio Olympics will remain as one of the most memorable in recent history for the US, not only for securing the highest number of medals but also for the numerous inspiring stories that the athletes produced. This is the first time Italy secured a spot in the list of most positive countries. In our global poll, Italy was highly praised for its welcoming attitude towards refugees. While speaking of Italy, delicious foods need to be mentioned, and on that note, Osteria Francescana in Modena, Italy was named the Best Restaurant in the World for 2016. Italian researchers have shone on the global stage and as recognition to that Italian scientist Fabiola Gianotti became the first female Director-General at the CERN Laboratory in Geneva. In 2016 Kenya carried the flag for the African region despite recent economic and political turmoil. Kenya ranked seventh in the world on how effectively children can access the justice system to defend their rights, and was the only country outside of Europe to make it to the top ten. Kenya became the first African team to win a World Sevens Series rugby tournament outside Africa by winning the 2016 Singapore Sevens tournament. The government of Kenya recently announced a significant commitment to restore 5.1 million hectares of degraded and deforested landscapes by 2030. Kuwait was the regional winner from Asia. Kuwait managed to maintain the highest level of positive diplomatic relationships with its neighbors and beyond. Kuwait discovered a new oil and gas field in the Western part of the country that is expected to provide a significant boost to the country's resource reserves. The Amir of Kuwait was recognized as the Humanitarian Leader by the United Nations for his support for the UN's humanitarian works. Iceland was named as the most positive regional country from Europe. Iceland ranked as the top most peaceful nation in the world in 2016. Their inspiring and uniting football team made history by playing their first ever match at a major tournament at the Euro 2016, and by making it through to their first ever quarter finals of the Euro football tournament. Cuba is the only winner in 2016 which retained its regional title from last year. In 2016 Cuba further improved bilateral relationships with big economies such as the United States of America and the European Union. World leaders, from all over the world, the USA, China, Japan, among others, visited Cuba with a message of collaborative positive future. Further sanctions on Cuba were lifted to expand collaborations. These positive steps in the right direction helped Cuba welcome millions of tourists, up from the same periods last year. Colombia was crowned as the regional winner from South America. This year Colombia presented the world one of the best ever messages of hope by signing a historic peace agreement with the country's largest armed group FARC, which is expected to end a 52 years of armed conflict. In recognition of such bold leadership shown to achieve peace, Colombian President Juan Manuel Santos was awarded the Nobel Peace Prize for 2016. Along with these great achievements, young Colombian researchers and entrepreneurs impressed the world with their respective initiatives. This year 4179 global citizens participated in our global poll with 49% men and 51% women. This is the first time ever we had more women participants than men. In total 30% of our global poll participants from Africa, Asia and South America voted for a country that is outside of their own continent. It is observed that Africans endorsed the North Americans, Asians endorsed the South Americans and South Americans endorsed the Africans in 2016. On the other hand, North American and European participants endorsed themselves. The global poll result suggests that World Peace, International Relations, Economy, Science & Innovation, Education, Environment and Sports were the most popular choice of positive accomplishments among both men and women participants while voting for their positive countries. D+ continued to observe the trend on the percentage of people hopeful for positive future, primarily the immediate future, based on the comments made during its global polls since 2011. It is observed that people’s positive outlook continued to decline since 2013. Apparently, confronting stances between neighboring countries, spread of terrorism and racial discrimination were the three main root causes identified for such decline in 2016. Certainly it was an eventful year and positive initiatives not only came from the winners but also from the countries that could not make it to the list in 2016. Finland was crowned as the greenest country in the world, and retained its top spot at the media freedom index. Chile declared their presence as the top football power house in South America by winning their second Copa America title in two years. In a remarkable public health achievement, Sri Lanka was certified by the World Health Organization (WHO) on having eliminated malaria, a life-threatening disease which long affected the island country. The United Arab Emirates (UAE) dared to be different by announcing the creation of a Ministry of Happiness devoted to ensuring the happiness of its citizens, and also rightfully kept its title of "World’s Charity Capital". "It is very encouraging to see increasing global interest for the D+ World's Most Positive Countries initiative despite all the ongoing negative events around us. It makes us ever more determined to bring you the very best of the world." says Dr. Arif Jubaer, Founder of D+. D+ will present the above information and facts in detail at a presentation ceremony on Friday, 25 November 2016, 5.30PM at the University of Melbourne, Australia. Switzerland is the World’s Most Positive Country for 2015, according to the annual global index published by Daily Positive (D+), a unique online media organization from Australia for positive news. It is the first time Switzerland took the top spot in this annual positivity index. The annual list of top ten most positive countries is compiled based on a positivity index comprised of a global expert panel rating, a D+ journalists rating, a global web poll and the number of positive news entries in 2015 on the D+ website. Apart from this overall list of ten most positive countries, for the first time ever, D+ also introduces a list of regional positive countries from Africa, Asia, Europe, North America and South America. The regional winners were selected based on the same criteria used to select the overall winners but from a specific region. The winners earned their places with some amazing positive initiatives and actions in 2015. Switzerland jumped to the top spot from last year’s fourth position with its consistent display of competitiveness in nurturing innovation and talent. Such sincere support helped projects like the solar-powered aircraft Solar Impulse 2 or the Large Hadron Collider to go to a new high this year. Switzerland also ensured the country’s productivity and prosperity by ranking higher in various prestigious indexes, such as, global democracy index, peace index, tourism-friendly index and education index. “Based on innovative environmental management practices, Switzerland has become one of the most sustainable nations in the world in the areas of climate change, biodiversity and habitat protection”, says one of our expert panel members. Second placed Sweden was not far away in terms of innovation and also in all the above mentioned indexes. Perhaps that is why this year the Swedish researchers won prestigious awards, such as, the Princess of Asturias Award for Technical & Scientific Research and the Nobel Prize in Chemistry. Sweden’s Eurovision song contest win made its long list of achievements for 2015 more entertaining. Sweden maintained its leading position in media transparency. China moved to third position in 2015, sliding down one spot from last year. One of the important diplomatic wins for China in 2015 was to be able to attract global interest to the Chinese-led development bank Asian Infrastructure Investment Bank (AIIB). China made significant progress with its domestic navigation system Beidou by launching new satellites and with the newly developed carrier rockets. Also, Youyou Tu of China won the Nobel Prize in Physiology or Medicine for her discoveries concerning a novel therapy against Malaria. This is the first time that any expert in Chinese traditional medicine has been awarded a Nobel. After retaining the top position for two consecutive years, England moved down to the fourth position in 2015. Despite its slow productive run this year, English researchers unveiled a graphene light bulb with lower energy emissions, longer lifetime and lower manufacturing costs. English archeologists have discovered one of Britain’s largest medieval hospital cemeteries. English pride prevailed at the World Snooker Championship, Women’s European Hockey Tournament and Ashes Cricket championship. Australia remained at the fifth position in 2015. Australian researchers have unveiled the world's first 3D-printed jet engine, the University of New South Wales and their robots defended their RoboCup World Football Championship title. Australia successfully launched one of the world’s most-advanced communication satellites Sky Muster into orbit, and they may have lost the Ashes to England but won their fifth One Day International Cricket World Cup at home. Germany moved up one position to the sixth spot in 2015 compared to last year. Germany was well supported in our global poll for its role with the ongoing Syrian refugee crisis. German construction of wind turbines reached a record high, German researchers helped develop a prototype quantum radar that has the potential to detect objects which are invisible to conventional systems, and Germany has been highly tourist friendly. The United States of America slid down to seventh position this year. Improved diplomatic relationships with Cuba and Iran were seen as the best foreign policy successes in 2015. Some of this year’s notable scientific achievements were, American doctors successfully transplanted, for the first time in the world, a scalp and skull while performing kidney and pancreas transplants. American researchers have discovered the world’s first warm-blooded fish – the opah. Researchers at Massachusetts Institute of Technology (MIT) have identified a brain circuit that encodes time and place. According to one of our expert panel members, “USA, despite not being able to combat its economic deficiency with full potential, continued to maintain perhaps the best academic system that allows them to keep up the great works.” It is also notable that the United States of America won the Women's Football World Cup for the third time. New Zealand made it to the eighth position in the list. New Zealand ranked high in the democratic and peaceful country indexes in 2015. New Zealand announced the creation of a 620,000 km2 Ocean Sanctuary in the Kermadec region, which will be one of the world’s most significant fully protected ecosystems. Also, New Zealand reported a budget surplus for the first time since 2008, meeting a target set in 2011 following the Canterbury earthquakes and the international financial crisis. Singapore is at the ninth position and made it to the list for the first time in our positivity index’s 5-year history. Singapore has been very competitive in terms of innovation and education. Singapore’s education systems, from school to the university, have been rated top-class in 2015. Also, Singapore‘s Botanic Gardens was recognized by UNESCO as the country’s first ever World Heritage Site. Despite slow response to the rescue of the missing Chibok schoolgirls, Africa’s biggest economy Nigeria stood firm with new administrations and fresh approaches against terrorism in the country. Nigeria signed a bill that criminalizes female genital mutilation in the country. In case these were not impressive enough in order for Nigeria to take the regional title from Africa, it is worth mentioning, the World Health Organization announced that polio is no longer endemic in Nigeria, bringing the country and the African region closer than ever to being certified polio-free. Bangladesh and India were jointly named as the most positive countries from Asia. Both the neighbors simplified their border by exchanging more than 150 enclaves of land and settled the long running dispute peacefully. It was widely compared to the Fall of the Berlin Wall. Moreover, Bangladesh has become a lower-middle income country. Bangladesh has shown outstanding leadership on the frontline of climate change that bestowed Honorable Prime Minister of Bangladesh Sheikh Hasina with the prestigious Champions of the Earth Award by the United Nations. On the other hand, India inaugurated Cochin International airport, the first airport in the world that completely operates on solar power. India continued to march forward with their space missions and most recently successfully launched its first space Multi Wavelength Space Observatory ASTROSAT. Finland was our regional winner from Europe. Its reputable education system, vibrant democracy, peaceful and innovative approach to national and international issues earned them the honor this year. Women’s empowerment and professional development were also high on the agenda for Finnish prosperity. Cuba was crowned as the regional winner from North America. Cuba restored full diplomatic relations with the United States and as a result, the United States removed many sanctions imposed on Cuba. Consequently, new travel and trade rules between the two countries came into effect, the diplomatic missions of each country became full embassies, and they have re-established direct telephone links for the first time in 15 years. Cuba is certainly back on the global stage with their own values and pride intact. Chile took the regional tittle from South America. Chile announced the creation of the largest marine reserve in the Americas in its Pacific waters. Chile won the Copa America football title for the first time in their history. Chilean scientists have been making the best use of the Atacama Large Millimeter/submillimeter Array (ALMA), an international setup of an astronomical interferometer of radio telescopes in northern Chile, with new and novel research outcomes. This year 4541 global citizens participated in our global poll with 61% men and 39% women. The global poll result suggests, Science and Innovation, Economy, Education, International Relation, World Peace, Environment and Sports were the most popular choice of positive accomplishments among both men and women participants while voting for their positive countries. Other choices were Freedom of speech, Tourism and Poverty Alleviation. D+ continued to observe the trend on the percentage of people hopeful for positive future, primarily immediate future, based on the comments made during its global polls since 2011. It is observed that people’s positive outlook continued to decline since 2013 and apparently this year it was hugely affected by the ongoing Syrian refugee crisis. Perhaps that is why World Peace moved down as the fifth most popular choice of positive accomplishment in the 2015 global poll compared with being the first choice in 2014. Apart from the winners, other countries have also shown tremendous resilience and achieved new heights. The small African island of Seychelles continued not only to attract tourists but also built solid diplomatic relationships with other countries. Japan’s win against South Africa in the Rugby world cup had to be the most spirited news in world sports in 2015. Tunisian National Dialogue Quartet for its decisive contribution to the building of a pluralistic democracy in Tunisia won the 2015 Nobel Peace Prize. Finally not to forget the heroic efforts that continued in Liberia, Guinea, Mali and Sierra Leone that almost eradicated Ebola virus. “D+ World’s Most Positive Countries is in its fifth year and this year it has been celebrated with more enthusiasm and excitement indicating global citizens are more eager than ever before to have access to positive news. It is one of the biggest wake-up calls for world media to give positive news a chance to spread." says Dr. Arif Jubaer, Founder of D+. D+ will present the above information and facts in detail at a presentation ceremony on 25 November 2015 at the University of Melbourne, Australia. England is crowned as the world’s most positive country for 2014, according to the annual global index published by Daily Positive (D+), an exclusive online media from Australia for positive news. In the fourth year of the award series, England topped the list of the world’s most positive countries for second year in a row. The annual list of top ten most positive countries is compiled based on a global expert panel rating, a D+ journalists rating, a global web poll and the number of positive news entries in 2014 on the D+ website. The top 10 positive countries for 2014 earned their places with some distinguished and diverse positive achievements throughout the year. For instance, England unveiled the world's largest aircraft, English scientists sequenced the genome of the world's oldest continuously surviving cancer, English doctors helped a paralyzed man walk again after a world first pioneering therapy that involved transplanting cells from his nasal cavity into his spinal cord, English researchers won various prestigious awards, such as, Millennium Technology Prize, Kavli Prize, Fields Medal and Noble Prize. Analysis of the comments made at the D+ global poll suggests that surviving the Scottish independence referendum and being able to remain unified with Scotland gave England that extra edge in the D+ global poll over other countries as it was seen as the toughest tests of all that any country in the list had to endure in 2014. The rise of China seems unstoppable as it climbed one step from last year to the second position in the 2014 D+ list of most positive countries. Despite controversial human rights records, the Chinese achievements simply could not be ignored. One of the biggest achievements for China during 2014 was the large trade and cooperation deals signed with the European Union, France, Russia, Switzerland and Britain, among others. China has overtaken the United States to become the world’s largest economy based on Purchasing Power Parity (PPP) measure, according to figures from the International Monetary Fund. China also launched its first experimental spacecraft that is scheduled to orbit the moon before returning to Earth. Signaling that China is firmly behind international actions to address issues, such as, illegal elephant ivory trade and wellbeing, it has seized and destroyed tons of elephant ivory accumulated through enforcement actions and banned smoking in schools with greater impact. The United States of America (USA) is in third position in 2014. USA continued to be impressive with research and innovation according to top ranked journal publications. However, this year they faced some steep competitions from Europe and Asia. Its efforts in Africa against the ongoing Ebola outbreak were hugely approving among the D+ global poll participants. D+ external expert panel members repeatedly recognized USA for its recent stable economic growth, decline in unemployment figures and steady foreign aids. In 2014 Switzerland moved up into the fourth position in the list from seventh last year with its robust economy. According to data published by World Economic Forum, Switzerland retained its crown as the world’s most competitive economy for the sixth year in a row. Apart from that, Science and Sports are the next two categories where Switzerland has shined with positive achievements. According to D+ external expert panel members, Switzerland was able to depict a sustained model of development with well-balanced economies between industries and Research and Development (R&D) investments, a developed democracy and excelling education systems, an effective government and political stability and appealing life style. Australia slid down to fifth position in 2014 list of most positive countries. Australia has attempted to improve relationship with its neighboring countries as well as with its larger trade partners, such as, India, Japan, China and South Korea in an effort to maintain a solid and sustaining economy. Also, creation of a smartphone-linked bionic pancreas, winning Microsoft Imagine Cup with eye-scanning health app Eyenaemia, making a unique kit containing 3D-printed body parts for medical schools, producing the world's most sensitive thermometer and in a world first, transplanting human hearts which had stopped are some of the other notable Aussie achievements. Sweden advanced two steps to sixth position in 2014. Among its different positive achievements, medical research stories kept Sweden exceling throughout the year. In particular, doctors in Sweden not only transplanted wombs into nine women donated from relatives but also in a medical first helped a woman to give birth to a baby boy with the help of a transplanted womb. Seventh placed Germany won the 2014 FIFA World Cup in Brazil and became the first European team to clinch the championship in South America. Germany continued to increase electricity generation from renewable sources and continued to maintain its integrity as a world-class manufacturer. Japan made it back to the list of most positive countries in 2014 and is in eighth position. Japan in 2014 ranked as the most efficient country in the Asia and Pacific region at turning creative inputs into tangible innovation, made notable progress in stem cells research, unveiled more advanced robots including world's first personal robot that can read human emotions, won Nobel Prize in Physics and attempted to increase the export of local products with the help of trade deals including free trade agreement with Australia. France is another country that returned to the list in 2014. France was able to increase cooperation with international communities in form of aid and trade deals, attracted a record-breaking 84.7 million tourists and won Nobel Prizes in Literature and Economic Science. Brazil became the first ever South American country to make it to the list of world’s most positive countries. Brazil has emerged as a regional leader and established itself as an exemplary democracy in the region. Brazil gained world’s admiration by hosting an impressive football world cup. The world cup brought economic growth in the country by means of infrastructures, stadiums, airports and tourism despite some unsatisfactory circumstances. There are three changes in 2014 from last year’s list of most positive countries. Canada, South Korea and New Zealand did not attract enough of our 3189 global poll participants with 64% men and 36% female. According to the 2014 global poll result, World Peace, Economy, Science and Innovation, Education, International Relation, Environment and Sports were the most popular choice of positive accomplishments among both men and women participants. Other topics of interest were Space Exploration, Better Public Services, Freedom of Speech, Tourism and Response to World Medical Emergencies. Further analysis on the top three popular choices of positive accomplishments - World Peace, Economy and Science and Innovation - against different age groups suggests individuals belonging to Middle Ages were more vigilant about Economy than others. On the other hand older generation was more interested into World Peace and younger generation was captivated by Science and Innovation. D+ top ten world’s most positive countries attracted supports from all around the world in our global poll. It was interesting to see the trends in supports by dividing the poll results into five major geographical regions and collecting a subset where individuals voted for a country different than their nationalities. For instance, Brazil attracted huge supports from Europe and the USA charmed the Asians including some endorsements from the Middle East. Finally, we analyzed the comments made during global polls in 2014 and in all past three years of D+ world’s most positive countries initiatives. It is found that the overall percentage of people hopeful for a positive future was steadily growing with an exception for this year where it dropped slightly compared to last year. D+ will present these and other observations in details at a presentation ceremony on 25 November 2014 at the University of Melbourne, Australia. The nations outside of the 2014 list of most positive countries also achieved some significant height. India successfully put a satellite into orbit around Mars, becoming the fourth country to do so and the first nation to arrive on its first attempt and the first Asian country to reach the Red Planet. Nigeria has overtaken South Africa as Africa's largest economy after a rebasing calculation nearly doubled its Gross Domestic Product. Nigeria has also shown the world a way to stop Ebola epidemic. In Bangladesh, thanks to a series of measures taken over the last couple of decades more girls are now continuing their education at the secondary level as enrollment of girls has risen to over 6 million from 1.1 million in 1991. While speaking of girl’s education, Iranian Professor Maryam Mirzakhani was awarded the 2014 Fields Medal, the most prestigious honor in mathematics, for her highly original contributions to the fields of geometry and dynamical systems and became first woman to win the prize, which was established in 1936. On the eve of the announcement, Dr. Arif Jubaer, founder of D+, said, "Despite ongoing conflicts, epidemics and other distressing situations around us, the global citizens continued to create hopes, possibilities and opportunities and D+ is determined to recognize these heroes each year." Positive accomplishments in the area of scientific innovation, economy and international relations are considered as the top three requirements for being one of the most positive countries, according to the Daily Positive (D+) global poll on positive achievements. D+, an exclusive online media for positive news, is pleased to announce the list of top 10 World’s Most Positive Countries 2013 (WMPC’13). In the third year of the award series, England jumped into the top spot in 2013 from last year’s third position. The World’s Most Positive Countries initiative recognizes the positive achievements, initiatives and actions accomplished by each country of the world. The list was compiled based on global expert panel rating, D+ journalists-volunteers rating, global social media survey, and the number of positive news entries in 2013 in the D+ website. On the eve of the announcement, Dr. Arif Jubaer, founder of D+, said, "We have seen increased interest around the world regarding this annual list of positive countries and the participations were higher than ever before. It was great to see D+'s mission to spread positive news is reaching out to the furthest corner of the world." The winners made it to the list with some great news and positive accomplishments throughout the year. England was impressive with scientific innovations, archeological discoveries and renewable energy initiatives, among others. Its contributions to medical science were highly regarded which include facilitation of world's first ever birth of a baby using Eeva technology which allows doctors to choose the healthiest embryos for IVF treatment and first ever successful liver transplantation while keeping the organ warm and functioning outside a human body. The United States of America moved down to second spot in the list this year. Alleged National Security Agency spying and government shutdown hurt the US popularity. However, it remained strong in research and innovation. China moved up into third position with its strong international diplomacy that continued to generate interests among countries around the world seeking economic partnerships with it. Despite maintaining strong economy Australia dropped to fourth position with political instability in the country. Germany not only maintained the leading role in the European Union but also continued to impress with its initiatives with renewable energy. The education system of Canada, particularly the research strength of its universities was highly regarded. Robust economy, environment friendly development and its diplomatic relationship with its European neighbors earned Switzerland the seventh spot in the list. This is the first time Switzerland made it to the list. Sweden climbed up two steps into the eighth position this year with its sustainable growth in education, research and excellent public services, though often came under scrutiny for the 2013 Stockholm riots. South Korea is another country that made it to the list of most positive countries for the first time. The handling of 2013 Korean crisis that almost brought South and North Koreans on the brink of a war was highly praised. Finally, New Zealand made it back to the list with its timely and competent decisions related to its biggest industries, such as, contamination scare of its dairy products in 2013. There were three changes in 2013 from last year’s list of the most positive countries. France, Japan and India could not make it to the list. Based on the global poll comments, France seems to have lost that charm of one of the leading nations of the European Union and struggled with issues like higher unemployment rate and war in Mali. On the other hand, despite experiencing strong technological advancements by Japan, the Fukushima disaster cleanup efforts alone had created substantial backlogs on Japan’s national policies, such as, investment in renewable energy. Series of sexual assaults on women badly destroyed India’s image which prompted the government to measure some recovery actions like introduction of visa on arrival for handful of countries in order to boost the tourism industry. Further analysis on the WMPC’13 result also provides some interesting insights. According to the global poll conducted for WMPC’13, Innovation and discovery, Economy, International Relation, Environment and Sports achievements were the most popular choice of positive accomplishments among 4254 global participants with 45% women and 55% men. Among other popular subject area of positive accomplishments picked by the participants are peace, literature, improved public services, freedom of speech and reduction in corruptions. Analysis of the comments made in the poll by the women participants suggests that women admire accomplishments related to ancient affair or nature, such as, archaeological discoveries equally with latest scientific and technological advancements. On the other hand, men were significantly more interested in positive accomplishments regarding economy, international relation and sports. D+ will present these and other observations in details at a presentation ceremony on 25 November 2013 at the University of Melbourne, Australia. The countries those could not make it to the top 10 also produced some great positive news stories. It was probably the best year yet for the women in Saudi Arabia. Among few positive changes, the Saudi women were not only granted seats on the country's top advisory council for the first time but also made history by reaching the summit of the world's highest mountain, Mount Everest. Russia continued to increase its positive image, slow but steady, for the second year in a row. Still shown dominance in space programs and was highly praised for its stand against Syria’s chemical weapons; amid likely confrontation with the US. South Sudan, the world's newest country, has advanced with work on offering training to returned soldiers as a means of boosting the economy, focusing on girls' education and making progress towards border security with its former rival, Sudan. Daily Positive (D+), an exclusive online media for positive news, is pleased to announce the top 10 winners of the World’s Most Positive Countries for 2012. In the second year of the award series, the United States of America took the top position from last year’s winner Australia. The World’s Most Positive Countries initiative recognizes the positive achievements, initiatives and actions accomplished by each country of the world. Based on the accomplishments, D+ publishes an annual list of 10 most positive countries. The points were calculated based on a global expert panel rating, D+ journalists-volunteers rating, a global social media survey, and the number of positive news entries in 2012 in the D+ website. This multifaceted positive news publications, analysis and global survey feedback of 2012 generated some great reviews for the winners. The USA maintained strong sense of innovation throughout the year, such as the Nobel Prize wins to Mars Rover of NASA. It has shown some positive signs of economic recovery. The presidential election campaigns attracted positive attitude towards the USA, which also demonstrated the great and stable political system of the USA amid fierce contest between the President and his opponent. Australia, despite the apparent political backlog, continued to maintain a strong economy compared to the other developed countries in 2012. The country was also praised for its contribution in medical science, efficient natural disaster management and for introducing tax on carbon emitters. It is the first country in the world to do this. England has been in the news for positive reasons, thanks to the 2012 Olympic Games and Queen’s Diamond Jubilee. Insights for Scotland's independence also improved the English image in general. China found its position in the top 10, being considered as a major driving force in the world economy, despite its economy showing signs of slowing down. Japan was hailed for their continuous progress in science, infrastructure and research despite the burden of natural disasters. Apart from these facts Japan was also praised for contribution in socio-economic development and humanitarian work. Germany and France are leading the current European Union crisis and to some extent considered as positive due to their impact on the world economy. Canada's involvements in global leadership issues were seen as somewhat limited. Nevertheless, its people kept maintaining better lifestyle. Canada was also acknowledged for political stability and humanitarian work. India's successful fight against polio stood out. Apart from that India has been creating positive image with their consistent economic growth despite alleged widespread corruptions. Sweden's winning of the Eurovision song contest title, as well as success in medical science and information technology helped the country to get into the list. People have shown great satisfaction in their lifestyle in Sweden. Apart from the top 10 winners, there was also positive news elsewhere. Burma had a year of positive political changes and reforms. Despite Russia's negative media coverage it established itself as frontrunner of the space programs, which also includes collaborative programs with the old rival America. Brazil not only kept showing leadership in the Latin American region, but also led with environmental initiatives to create examples for the rest of the world. Australia is the most positive country in the world! Daily Positive (D+), a non-profit wiki-based project, has revealed today the list of World’s Most Positive Countries in 2011. The homeland of Kangaroos and Wallabies has topped the list, with the United States of America and England securing the second and third positions respectively. The list of world’s 10 most positive countries 2011 is the first of its kind to recognize the positive achievements, initiatives and actions accomplished by each country of the world. Each country was assigned a score and ranked based on a number of factors, including ratings from external experts panel, global D+ volunteers/journalists, D+ social media fan, and weighted rating based on the most number of positive entries and visitors to each country page on D+. Australia clinched the title of the world’s most positive country in the global poll of over two thousand participants from all over the world. Approximately 25% of the voters quoted Australia as the top most positive country. In the global poll Australia was highly praised as one of the rare developed nation which avoided the recent global financial recession with minimal concern. Apart from that Australian page on D+ was the most visited page in 2011. Also Australian, Japanese and the Americans were the top three nations who visited D+ the most in search of positivity. The United States of America ranked 2nd in the global poll, however, the United States page on D+ had the most positive news entries than others. England, France and Germany were seen as of the new global leaders, overtaking the United States in the face of the recent Arab uprising and European financial crisis. Japan, China and India made it to the list for their respective positive achievements and actions. Japan was recognized for overcoming one of the worst nuclear fall-outs in history and still remained dignified, China made it - even being in the midst of all kinds of negative news related to human rights - because Chinese has shown the positive hardworking spirit to the world community and India was recognized for overcoming the stigma of being one of the poorest nations. Finally, Canada and New Zealand were recognized as silent achievers. Apart from the winners there are many notable points that came out of the world’s most positive countries 2011 initiative, such as, Libyan revolution was considered as positive amidst concern about the future, Brazil’s determination to come out of the shell of third world countries was considered commendable and Zambia was hailed for undertaking successful election to ensure the smooth transition of power from the incumbent to a candidate from opposition camp. This page was last edited on 13 March 2019, at 18:40.